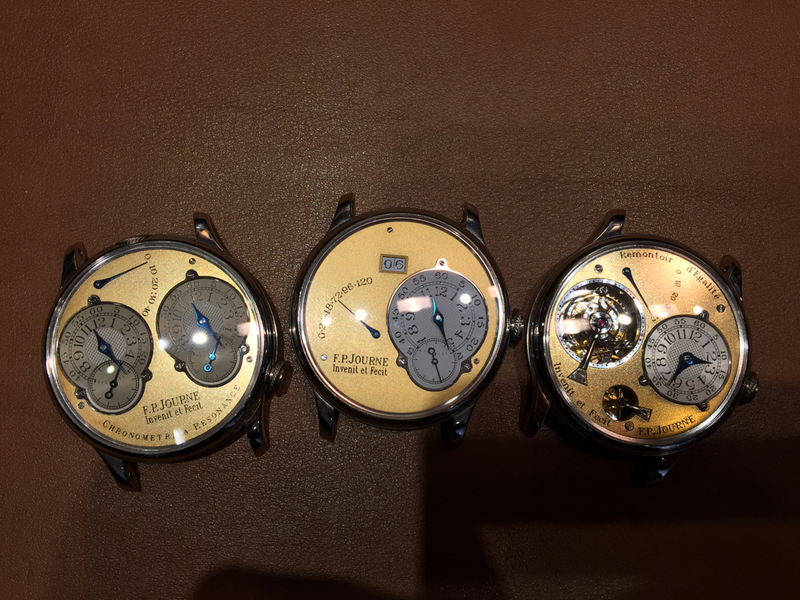 TimeZone : FP Journe » A Tale of Three Watches - "Metamorphosis"
Continuing the stories of three watches, this is the third story, about the third watch. You can read part 1 here (click me) and part 2 here (click me). This is also the one that took the longest to find. Partly because of my indecisiveness, partly because it was very hard to find. In the approximately eight years I chased this watch on and off I only saw three examples for sale, and that includes the one I ended up with. 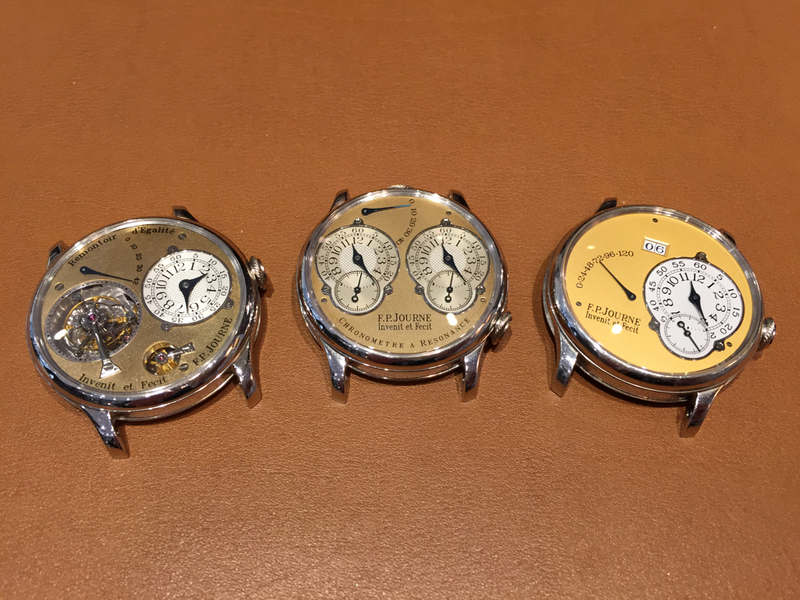 Wouldn't it be cool to have the original three watches in the Journe collection? Yes, it would. The three that I originally saw at the dealer. The three in the first "catalog" I got. This thought was always in the back of my mind whenever I had squirreled away some money for the "next watch." I always talked myself out of it. Why? Because I didn't need it. 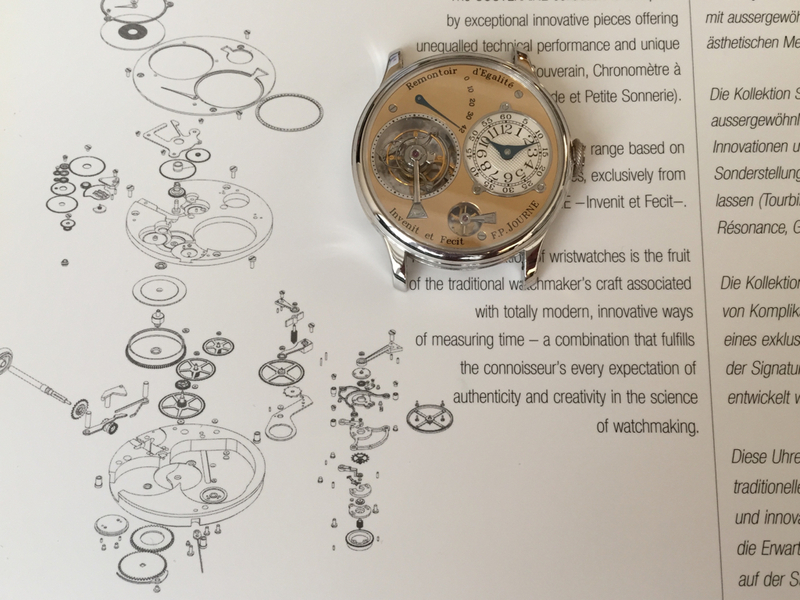 It looked just like the Resonance and Tourbillon so was redundant in the looks department. I would never wear it. The Octa had been updated and was now at version 3 with improved movement. The reasons were endless. But with any obsession, err, passion, when you daydream the dream eventually takes a life of its own and engulfs you until you have to give in. There was a slight problem with the chase. Right around the time F.P. 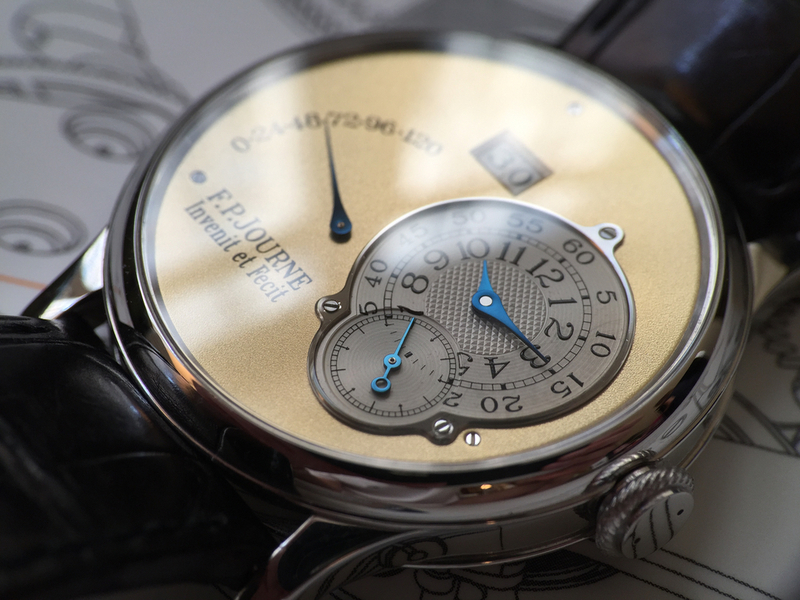 Journe launched the Octa, he was changing the way dials were made so they would be more consistent. 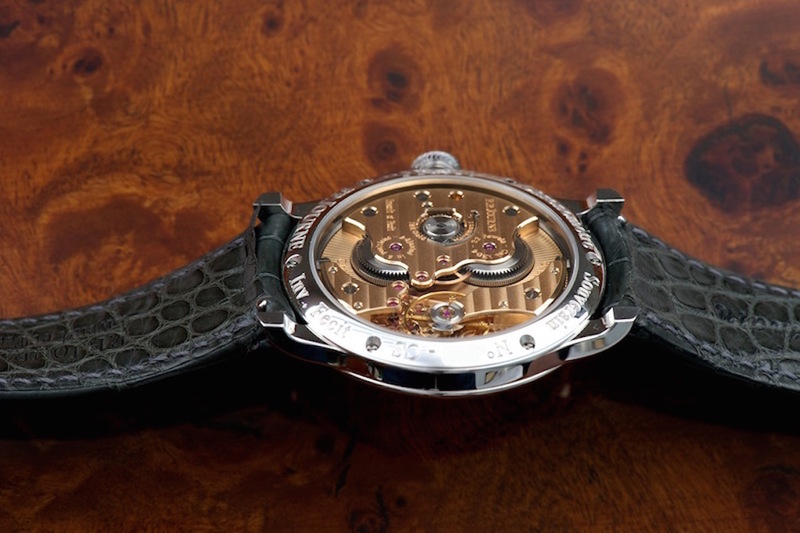 This meant that very, very few Octas had a yellow dial similar to my Tourbillon and Resonance. 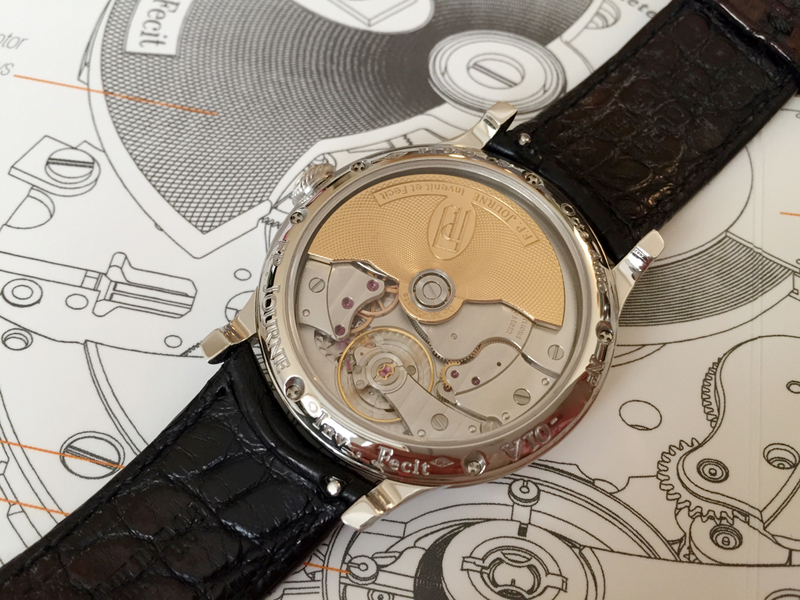 And the same goes for the silvery subdial with crisp guilloché. They would look like my Octa Lune, with a rich egg-yolk yellow and stark white subdial. Now, you might think that this is not a big deal, when you eventually find one you'll go for it. True, but Journes are not produced in quantity, which means most available for sale would be online or with faraway collectors, who would have to email you photos. Photos that make it very hard for you to tell the exact color of the dial. So many self-inflicted problems, I get annoyed just writing about this! But! As it turns out there was a good way to tell, or at least give a good indication on the production date, and I'm not talking about the serial number. It was the movement. 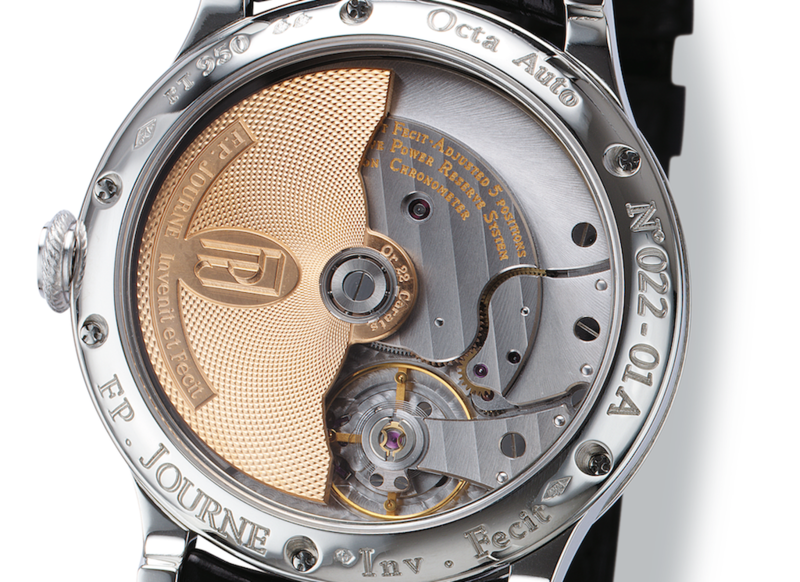 When Journe first made the Octa, it had a straight côtes de Genève finish in the center and a frosted outer ring. 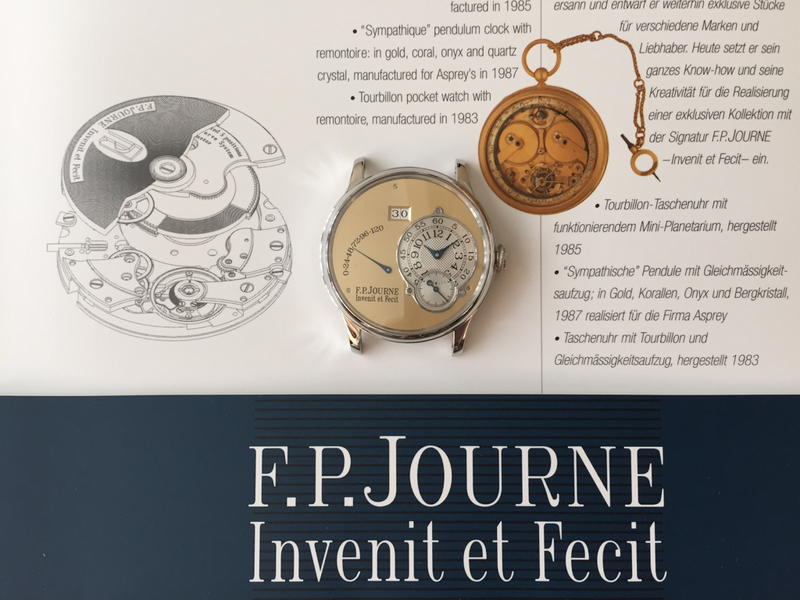 Pretty soon after production started that got changed to a circular côtes de Genève which we still see today with the gold movements. A watch with that early movement had a good chance of having an early dial, and it was quite easy to see the movement in photos. Now the wait happened. Nothing. One day I got tired of waiting, and decided to risk letting the collector market know that I was looking for one. I posted a WTB. The result surprised me. I got a reply to my post by a collector whom I had long admired. I already knew about and had seen photos of his Octa. His piece was none other than the Octa I used as a reference. The one against which I measured all other Octas. And now this piece was being offered to me! Talk about grail, and direct from the original owner. As you may have guessed, this is where the arm of the record player screetches off and the music stops. Of course there was a problem! 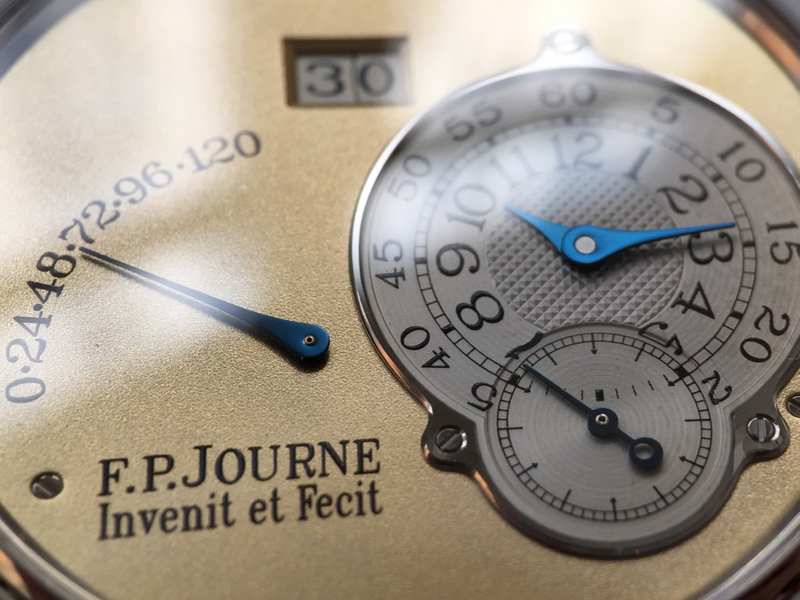 One of the reasons Journe changed the manufacturing process was to make the dials more stable. The early ones could oxidize and were generally different in appearance between one another. And boy did this one oxidize. It turns out a tiny scrap of metal got embedded in the dial during the finishing process and over the years it started turning black. Unfortunately the owner had never sent it in for service so there was no stopping the discoloration. 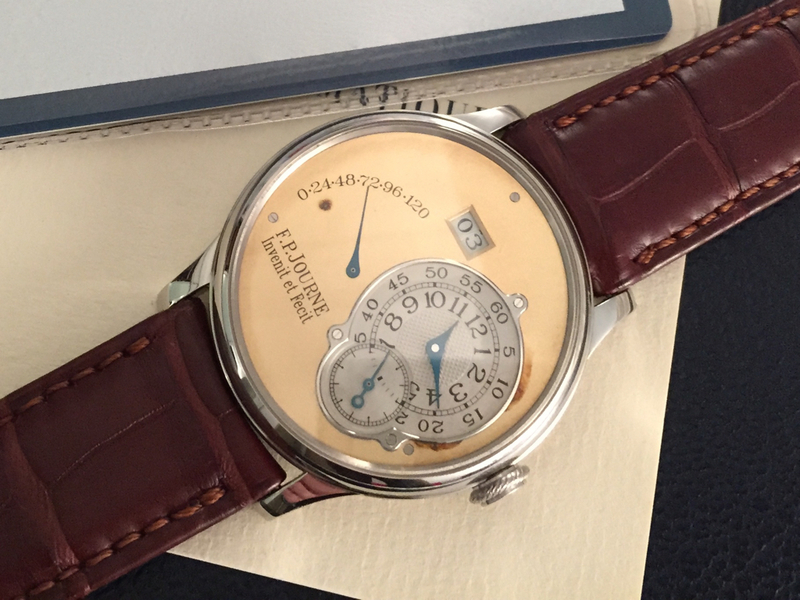 Could Journe clean this dial? I don't know. I had seen a post online about someone else with a similar oxidation that had it cleaned, but this was much worse. This interaction was in 2010, and at the time I was about to buy a Chronometre Souverain and had to choose between my grail Octa and the CS. I chose the CS. The dial bothered me enough to pass, and I thought to myself that I could keep looking for another one, there was no rush. Four years passed and I saw another for sale but I was too late, when I saw it, it had already sold. No others. So I went back to that collector. He still had the watch and he was still willing to sell, bless his heart, although with four years passing there was some adjusting for inflation. I didn't know there was that much inflation in four years but whatever. I had made a mental note of the price I was willing to pay and luckily the new price was just below. In those years he had also been in contact with Montres Journe in Geneva and they had emailed saying they could clean the dial. I did the deal. That was on December 1st, 2014. When I got the watch it was everything I expected it to be. Despite the blemish, which is worse in photos, the dial was a beautiful shiny yellow. The subdial a lovely silver with some patina. I wore it for a couple of weeks and dropped it off at the boutique to go in for long overdue servicing and dial cleaning. I get the estimate, ok. About a month later I get an email. They can't clean the dial! Most people think the "F" in F.P. 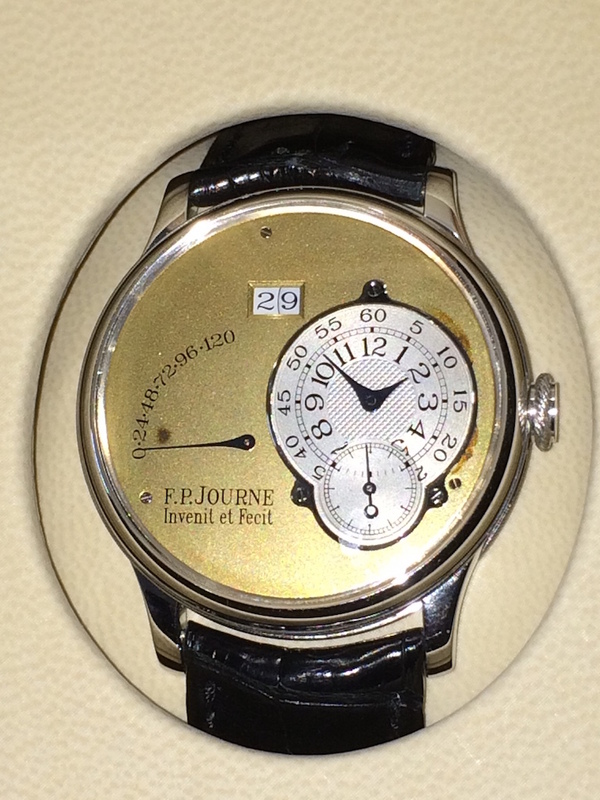 Journe stands for François. To me it stands for flagellation. More specifically self-flagellation, because that's how I collect Journes! So now what could I do? I could live with the blemished dial, or I could change it. Knowing myself I figured the dirty dial would bother me enough that I should change it. 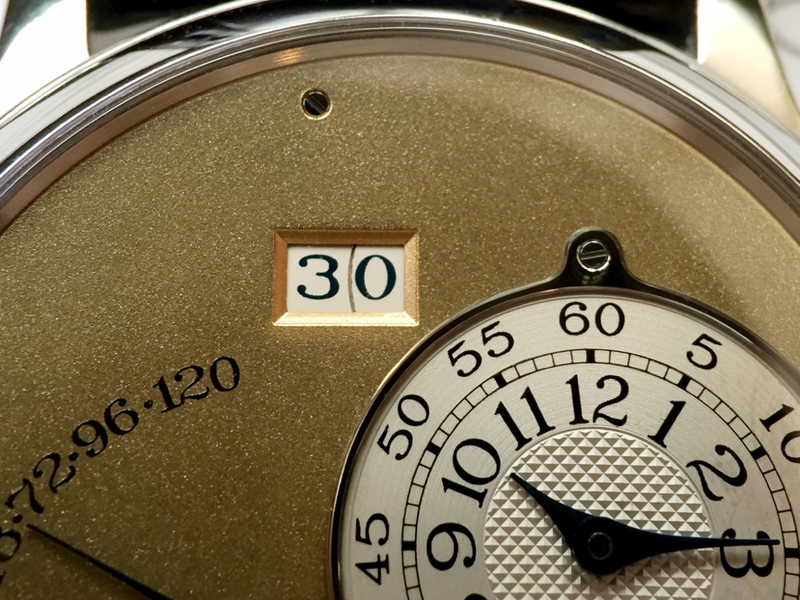 After all, the nice thing about the Octa is the expansive frosted dial, and any marks there detract from that look. 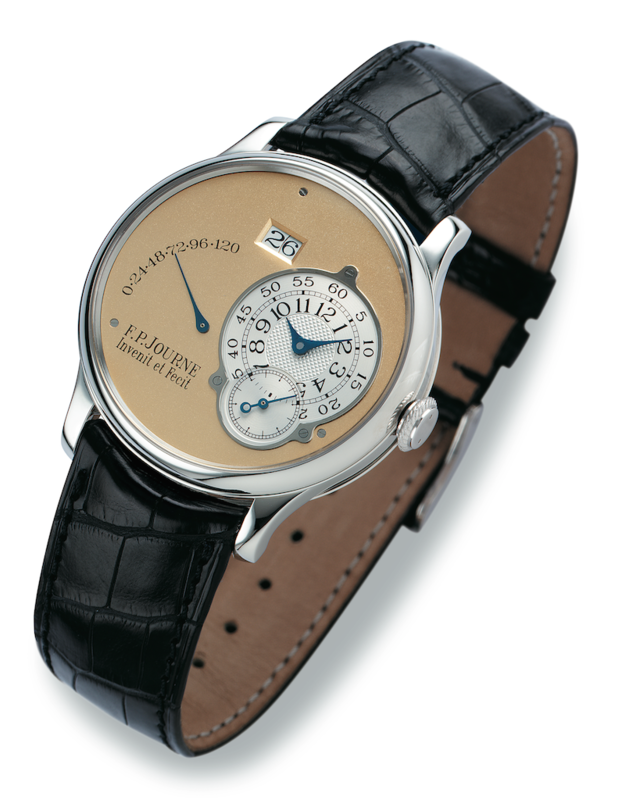 I would also get to keep the very early crisp subdial, which regardless of dial color adds texture. 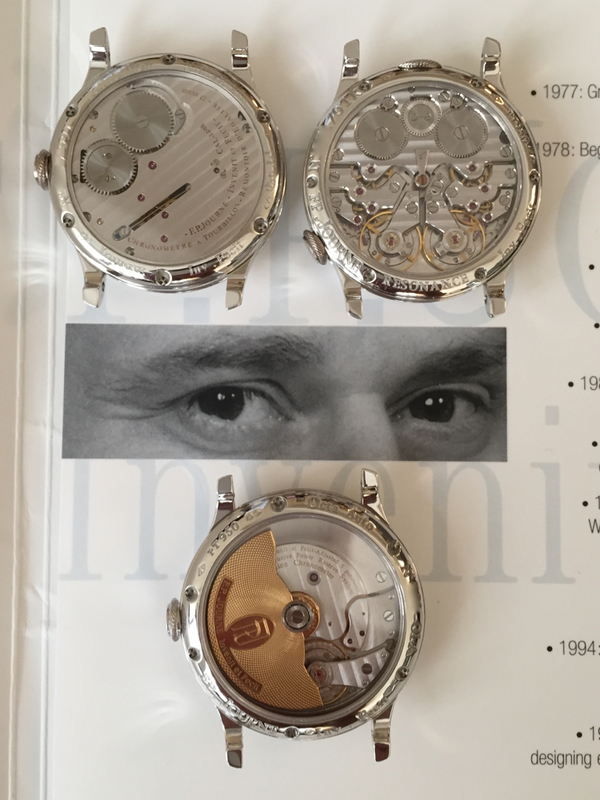 I was able to compare my original two pieces with a later Octa to see how the dials looked. In some cases they were similar but in others quite different. Still, I didn't have much choice. And I would still have the original three pieces. During burgers with a friend and fellow collector I recounted the latest developments. He went into a tirade about what a mistake it was to replace the dial of a "vintage" watch. How I would tarnish its originality. Cue rolling of the eyes from me. He was right, but I didn't have much of an option, my choices were to keep the bad dial or change it. 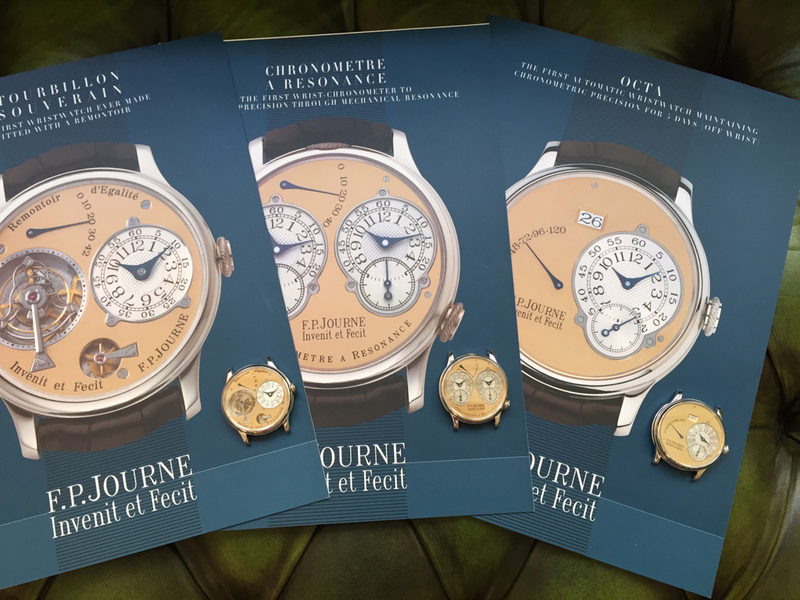 Nevertheless I went back to Montres Journe and asked if I could keep the original dial, just in case it could somehow be cleaned down the road. Sorry, no. 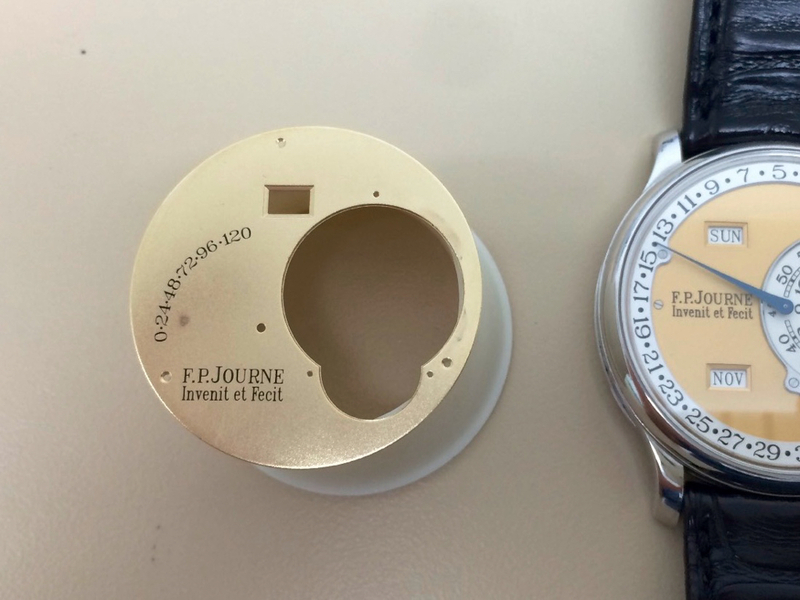 By now Journe was a bigger brand and their policy is that parts don't get returned, like many other brands. So it looked like I was stuck, until François-Paul got wind of this predicament. 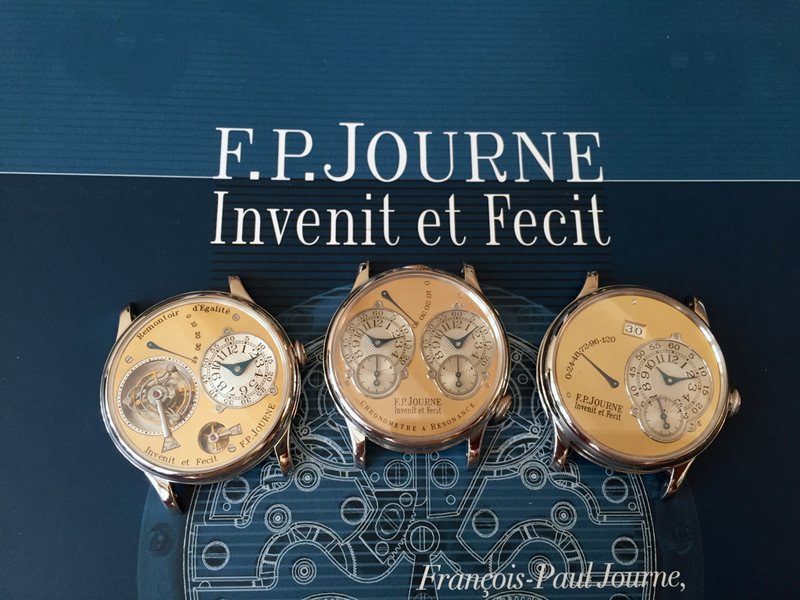 Some of you may know that François-Paul is very much an active watchmaker. One of the things he does with new models is wear them every day and he works on them himself to iron out the issues. So it was no surprise that once he saw the dial he smirked. He liked the challenge. When I bumped into him at Baselworld in March he told me he was making progress and I should have it back soon. With laboratory goggles resting on his forehead, FP put one hand in his white watchmaker's coat pocket and with the other raised the dial, firmly held between wooden tweezers. He twisted it against the light to check the surface. It glistened in the afternoon Geneva sunlight coming through the window to his right, Janvier's Resonance clock, breaking the workshop silence, on the wall to his left. The dial looked good. The months of experimentation with bespoke solvents and electrolyte solutions had finally paid off. At least that's how I imagine it happened, I have no idea what he did, other than he took his sweet time with it. I got the watch back six months after dropping it off. I could have called this story Patience. 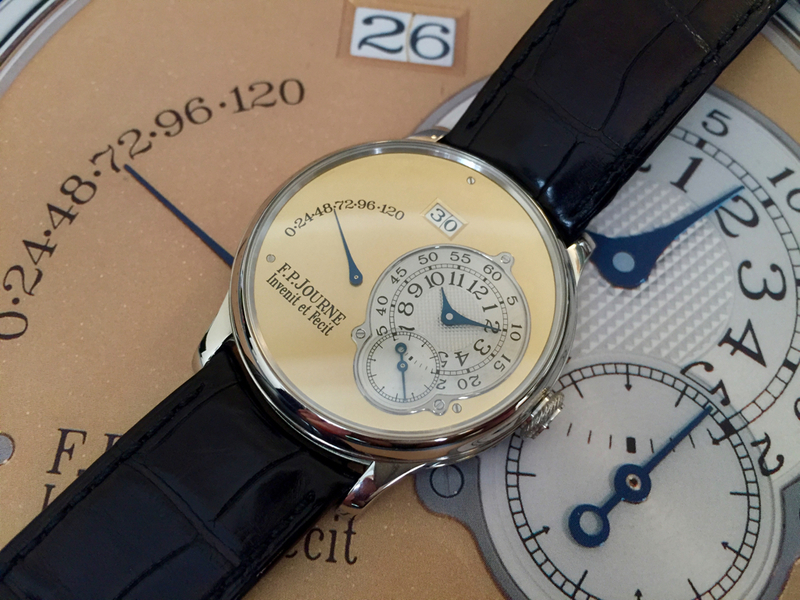 But it was more than waiting for a watch, it was my Metamorphosis into a Journe collector. Here's why. 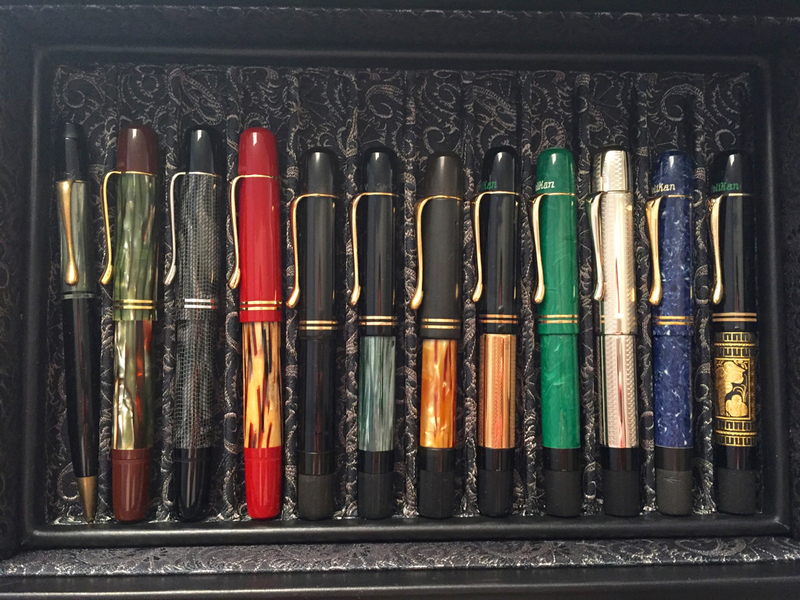 I also collect fountain pens, but very specifically only Pelikans, either the vintage model 100/100Ns, the vintage re-editions that look like the 100/100Ns, or the 400s, which are about the same size. I buy all of them, in every color, whether I like them or not. Luckily it's a small set and they don't come out with that many new ones, so I end up getting one pen maybe every two or three years. Even though I use them in rotation it is something I consider a collection. Until now, watches to me were more of an accessory, like shoes or clothes. I had sporty ones, dressy ones, etc. Sometimes there was an overlap but never too much. 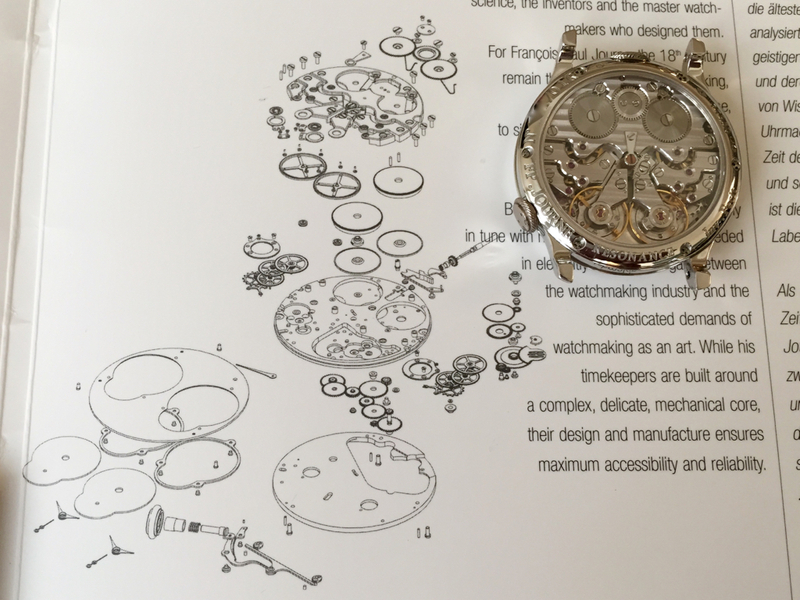 The Octa was the first watch I bought as a collectable, like the pens. Not as a watch to wear for a certain purpose, but just because it belongs to that original collection of three pieces. To have in a box with the other two and stare at. Like the watch from the Swatch Club I posted in the first story (if you have been following along I told you there was a link!). I bought it because it belongs in a set. I have been wearing it to work every day since it came back, but I'm sure eventually I'll go back to the CS or rotate with one of the other early pieces. A sense of calm has come over the watch box, like I dropped in the last piece of the jigsaw puzzle and now stand back looking at the completed work enjoying it. 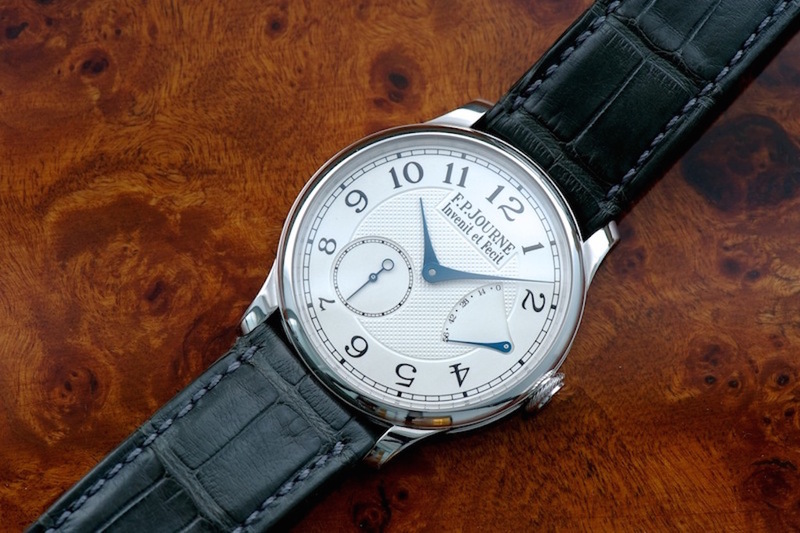 Maybe this is the last Journe I'll buy because I'm done now? We'll see. I hope you enjoyed this series.